April 20, 2012 (LifeSiteNews.com) — In the wake of a decision by the nation’s Supreme Federal Tribunal determining that babies suffering from the birth defect known as anencephaly aren’t “legally” alive, and therefore can be freely aborted, Brazilian doctors are explaining to the media how such babies will in fact be killed under the new legal regime. Abortions of ancephalic babies will be performed in the second or third trimester. 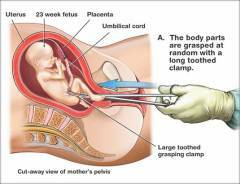 A curettage abortion uses a loop-shaped knife to cut the child to pieces, and then scrape his body and placenta from the uterine wall. An aspiration abortion uses powerful suction to tear the child apart, and likewise separate him from his mother. According to doctors, if these methods are inadequate in later term abortions, Dilation and Evacuation (D&E) would be required, involving a clamp that is used to tear apart the baby’s larger body. Dr. Vital told Veja that abortions on anencephalic children could be performed up to the ninth month of pregnancy. Dr. Vital added that such abortions will require a committee of doctors to determine the proper “criteria for diagnosis” of anencephaly, a condition whose exact definition is not agreed upon by physicians. Anencephalic babies fail to develop the top parts of their heads, including the skull and upper brain. Most die in the womb or shortly after birth, although some have lived for days, months, and even years with the condition. In the United States, an estimated 95 percent of anencephalic babies are killed inside their mother’s womb. “Paradoxically, [Minister] Marco Aurélio admits that the anencephalic dies in a short period of time. Tell me, how can he die if he’s already dead?” asked Lodi da Cruz.